The second half of the 2002 tour with no name covered Europe and Australia. After two concerts in London and one in Paris, Morrissey and his band traveled to Australia for seven dates then returned to Europe, including a handful of gigs in the UK. The purpose of the 2002 tour (the Tour de Force to use Morrissey's words because he was 'forced to tour') was for Morrissey to remain in the public eye and to secure a record contract. The tour got a reasonable amount of media attention and Morrissey managed to prove to the world that he was still able to fill venues and make headlines. The man was very playful and talkative, and seemed more at ease on stage than ever before. The UK dates at the end of this leg were particular successful, they surely are among his best ever. Overall many fans who attended agreed that this might have been his best tour so far. They were generally very ecstatic, they often tried desperately to make it on stage, fought for scraps of shirts thrown into the audience and sang along with (a surprised) Morrissey on many songs, including - thanks to the internet - the new and yet to be released new compositions. However, the positive impact of this tour, if there was one, wasn't to be felt until 2003 when Morrissey finally signed a deal with Attack/Sanctuary. At the time when these dates took place, despite the positive media coverage, there was still no record contract on the horizon and Morrissey was starting to show signs of pessimism and at times hinted that his career might approaching the end. He would ask his fans in between songs or while saying goodbye, to "please don't forget me", or say "When you're dancing, and laughing, and finally living, hear my voice in your head and think of me kindly", and expressed his doubts whether or not he still had his place in the current music industry or was still relevant outside his fanbase, etc. He returned to Frank Sinatra's "My Way" (a looking-back-on-the-past type of song) as exitus music. "Hand In Glove" was introduced into the set near the end of the tour and many fans believed Morrissey chose to do so for its subject of a dying relationship (him and music/fans) and the last chorus of "I'll probably never see you again" sent shivers down many spines when it was sung. The most paranoid minds imagined the worst with new songs titles such as "First Of The Gang To Die". The song's subject is gangsters, but typically Morrissey meant a different context as the song was introduced at London's Brixton Academy with a list of dead rock stars, the first of their gangs to die: "Steve Marriott... Brian Jones... Joey Ramone..." It was even introduced in Stockholm with "This is a song called 'First Of The Gang To Die', which will probably be me..."
A new tradition established in 2002 was the introduction by Morrissey of his musicians halfway into the concert. The introductions were often humorous, and would often end with Morrissey picking on Alain. Something else that was rather new was Morrissey being 'religious' and crossing himself on stage or wishing his fans to be blessed by God and Jesus (and other non-religious dead heroes such as Klaus Nomi, Johnny Thunders, Nico or Oscar Wilde). "Meat Is Murder" was usually introduced with a lecture on meat eating, fur or something related. The song's performance was less harsh than on the Oye Esteban tour, but just as dramatic and still ended in red light with Morrissey writhing on the floor while Boz pretended to stab him with the neck for his guitar. Morrissey still did the unexplained triangle figure with his fingers and the song ended with drummer Dean Butterworth banging a huge gong. Personnel: Boz Boorer (guitars, clarinet, banjo) , Alain Whyte (guitars), Gary Day (bass) and Dean Butterworth (drums). There was no opening band in Greece. 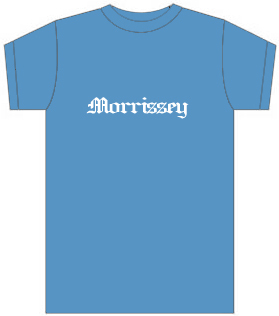 -A blue t-shirt with Morrissey's name on the front in white Old English font. View. 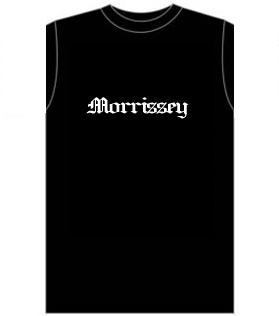 -A black tank top with Morrissey's name on the front in white Old English font. View. -A white shirt with Morrissey sitting on a lion statue next to his name in blue Old English font. 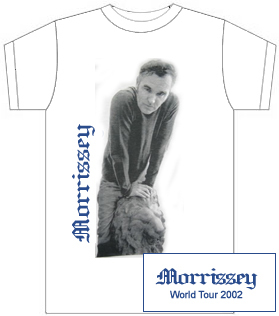 The back has 'Morrissey World Tour 2002' in the same font and colour. View. 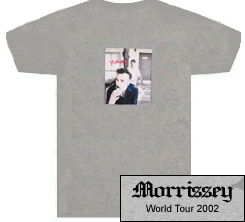 -A grey shirt with on the front a photo of Morrissey eating an ice cream sandwich with the word 'yummy' in red. The back said 'Morrissey World Tour 2002'. View. -A new black women's t-shirt was added in Dublin with 'Morrissey' on the front and back (photo needed). -A white shirt with Morrissey's name on the front was also sold here and there (photo needed). -A black and white poster of Morrissey in the desert scratching his neck; £5 in England. View. -The shirts were 25/30 euros in Dublin, 30 euros in Scandinavia, 34 euros in France, £18/£15 in England. -The only merchandise sold in Greece were the stickers, for 5 euros each. Bobby Heller And His Orchestra with Bette Davis and Debbie Burton - Whatever Happened To Baby Jane? Entrance: "A Child Ill" recited by John Betjeman. Morrissey came on stage to the sound of church bells at the end of the poem. Exitus: the sound of church bells followed by Frank Sinatra's "My Way". The setlists for the second half of the 2002 tour were as static as on the first half. The sets usually featured 17 songs, occasionally 16 (or 15 and even 14 for some Australian festival dates), selected from only 20 titles. New compositions "The World Is Full Of Crashing Bores", "I Like You", "First Of The Gang To Die" and the recently introduced "Irish Blood, English Heart" were regulars in the set, although "First Of The Gang To Die" was dropped for two Australian festival gigs. The other new song "Mexico" which had been a regular on the American leg was only performed on a few dates early in this section, then dropped forever. The song was probably considered more relevant by Morrissey where he had a latino fanbase than in Australia or Europe. The Smiths catalogue was still represented by set opener "I Want The One I Can't Have" and encore "There Is A Light That Never Goes Out" (except for a few Australian festival gigs without encores), as well as the vegetarian anthem "Meat Is Murder". In Lyon Morrissey introduced "Hand In Glove" which he hadn't performed since the Smiths days. The song then remained in the setlist until the end of the tour. The "Viva Hate" period was still heavily featured with singles "Suedehead" and "Everyday Is Like Sunday", their b-sides "Hairdresser On Fire" and "Sister I'm A Poet" and album tracks "Alsatian Cousin" and "Little Man, What Now?". "Late Night Maudlin Street", which was a regular on the recent American dates, was only performed here on the first five ones, then dropped for the rest of the tour except for two Scandinavian gigs. It was a live favourite, but it often killed the momentum and that might be why Morrissey gave it less exposure. The remainder of the sets included only three mid-career songs. "November Spawned A Monster" was a regular except on a few early dates before "Mexico" was dropped. "Jack The Ripper" and "Speedway" were the other two fixtures. Finally, the Dublin fans were lucky enough to be treated to a cover of Gilbert O'Sullivan's "Nothing Rhymed" on both nights when Morrissey played their city. The song had never been performed by Morrissey before and hasn't since. Here is the number of times each song was performed on this leg, in descending order of frequency. This is based on 24 concerts. The 2002 sets featured mainly older songs being played live for the first time (or for the first time in many years), and new songs that would only be released two years down the road. The older numbers were often updated lyrically by Morrissey and the newer ones included elements or lyric variations that would change or be dropped before the songs were recorded for posterity. It must also be said that certain titles were played slower than their album counterparts, namely the 'banjofied' "Everyday Is Like Sunday" (read further). In "Alsatian Cousin" Morrissey started the leg by changing "PS bring me home and have me" to "please bring me home and have me", but halfway through he reverted to the song's original lyric and never went back. Samples of barking dogs were used during that song's bridge. In "Little Man, What Now?" 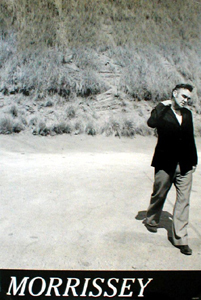 Morrissey sometimes changed '1969' to '1979' or '1989', but the most notable update was the change from "down to a few lines in the back page of a fading annual" to "back to the mean melancholy streets that you came from". In "Suedehead" the man usually changed a line to "...just to see all the crap you knew I'd written about you". The song was slightly extended by a few bars at the end then segued into "Little Man, What Now?". As on the Oye Esteban tour "Hairdresser On Fire" was significantly updated. The song started with "Where is London, so much for London" and the other occurrence of "here is London" was replaced with "so much for London" as well. However in some cities Morrissey took this a step further and replaced London by something else, like Crumlin for example. He did the previously heard "psychologically shave me", "stoned around Sloane Square", "too busy to kiss me" and "when he said I'm gonna screw you, I felt quite happy for you". In the latter case he even sometimes took it to "I felt quite jealous of you" or "I felt quite sorry for you". He still did "home of the crass, outrageous and free" very often, but sometimes varied it with "home of the flash, outrageous and free" or "home of the fast, outrageous and free". The recently introduced change "can you tease me into an empty page of your diary" was now done almost every night. Morrissey usually replaced "you are repressed but you're remarkably dressed, is it real?" with "you are depressed, but you're remarkably dressed, and that's all you need" or "I am depressed, but I'm remarkably dressed, and that's all I need". There were many other minor changes, between "busy busy", "busy scissors" and "busy clippers", and between "supernaturally save me" and "supernaturally change me". "Late Night, Maudlin Street" was the other heavily updated song on this tour. In this case Morrissey dropped complete verses and rearranged the rest. The new arrangement didn't feature the "winter push on" intro nor the "wherever you are I hope you're singing now" outro. The whole part between the lines "When I sleep with that picture of you framed beside my bed" to "I had sixteen stitches all around my head" was completely dropped. The verse "don't leave your torch behind / a power-cut ahead 1972, you know / and so we crept through the park / no I cannot steal a pair of jeans off a clothesline for you" and the line "I'm packed" were also dropped. Then the lines "but you...without clothes oh I could not keep a straight face / me - without clothes? well a nation turns its back and gags" were reversed with "I am moving house / a half-life disappears today / every hag waves me on (secretly wishing me gone)". Finally the verse "There were bad times on Maudlin Street / they took you away in a police car / Inspector - don't you know? don't you care? don't you know - about Love?" was also dropped. "Late Night, Maudlin Street" not only featured those structural changes, but also lyrical ones, some minor and others more important. Morrissey sang "love at first sight sounds trite", "how you stood on the day", "I never stole one happy hour around here". He sometimes sang "every slag waves me on secretly wishing me gone". The line "There were bad times on Maudlin Street" was salvaged from one of the dropped verses, it replaced "the last bus I missed to Maudlin Street". "Your gran died and your mother died on Maudlin Street" was changed to "Your gran died in pain and ashamed on Maudlin Street". Finally Morrissey dropped the word 'complaining' in "complaining: 'Women only like me for my mind'", which changed the subject of the line and made it sound like he might be the one complaining instead of the person driving him home in the van. "Everyday Is Like Sunday" was given a whole new live musical arrangement by being played slower and with Boz on the banjo. However Morrissey was slightly more conservative with the song's lyric alterations than on other tours. He still sang "scratch on a postcard" and "please come, please come nuclear bomb". He followed the song's final line "everyday is silent and grey" with a mumbling of "...when you're on your own". The live changes in "Sister I'm A Poet" were the usual ones. Morrissey sang "does anybody feel the same way I do?" and replaced "Oh no, no, no-no, waiting at the lights but not this time" with "A plastic bag stranded at the lights, this once was me". As usual Morrissey dropped the final verse from "Jack The Ripper" and replaced it with a repeat of the chorus. He was more conservative than usual with his lyric changes in "November Spawned A Monster". Only the ones to "you're just so ugly, you're so ugly" (or sometimes "she's so ugly, she's so ugly") and "please hug me, please hug me" remained standard. He more or less stopped doing "a symbol of where all mad lovers must always draw the line" (or variations thereof). On a few occasions the latter line was followed by "No, thank you, no". Boz played clarinet during the song's bridge, as he had done on the 1991 Kill Uncle tour. Unlike past tours the intro to "Speedway" wasn't dropped from its live arrangement. It was done very slowly and followed with a tension-building gap before the motor sound kicked in. As before Morrissey replaced "it won't work" by "it won't happen", "it just won't happen" or "it's never gonna happen" and changed a line to "until this (or 'my') ugly mouth gets shut good and proper, forever! (or yes!)" In new composition "First Of The Gang To Die" Morrissey usually sang "first lost lad under the sod". Once or twice he sang "first lost lad to be under the sod" or "first lost lad dead under the sod". Finally halfway into the leg he settled on "first lost lad to go under the sod" which is what he would eventually record and release as the definitive version of the song. In "The World Is Full Of Crashing Bores" he stopped singing "educated criminals represent the law" and adopted "educated criminals work within the law", which is what he would record for posterity. In "Irish Blood, English Heart" Morrissey alternated between the original "racist or racial" and the alternate "racist or partial" which he would eventually settle on for the recording of the studio version. In "Mexico" he sang "you'll be alright" instead of the first two occurrences of "you think you're so right" and "you'll be okay" instead of the final occurrence of that same line. In "I Like You" he sometimes changed "magistrates who spend their lives hiding their mistakes" to "magistrates who spend their lives shielding their mistakes". Finally there weren't many changes in the Smiths-era material. "Hand In Glove" was rather faithful to the Smiths version. Performances of set opener "I Want The One I Can't Have" were always very passionate and Morrissey emphasised lines by purring on 'r' sounds (such as 'these are the rrriches of the poorrrrr'), or extending others to "please, come 'round" or "Jesus! it's driving me mad look! it's (written) all over my face". As usual the chorus lines from the end of "There Is A Light That Never Goes Out" were dropped. Instead Morrissey used that time to escape the venue while his musicians finished the song and the crowd supplied the vocals. The musical arrangement of "Meat Is Murder" was slightly less dramatic than the one from the Oye Esteban tour, but still very powerful. Morrissey didn't strain his voice as much and the drums were not as proeminent. An addition to the performance of that song was the banging of a gong at the end after Boz pretended to stab Morrissey as he lay on the floor writhing like a dying animal. As on the latter tour Morrissey changed the song's final line to "and do you care how animals die?". Live versions of "I Want The One I Can't Have", "Speedway" and "Late Night, Maudlin Street" from the 17 September concert at London's Royal Albert Hall were released in 2006 as extra tracks on the "I Just Want To See The Boy Happy" single. A live version of "I Want The One I Can't Have" from the 30 September concert in Paris was made available for purchase as a digital download at the time of release of the latter single. There aren't many visual souvenirs of this tour out there, but still a few more than for the earlier American leg. Both London dates at the Royal Albert Hall (17 September and 18 September) were filmed by three different fans. At least one out of those three recordings (for each date) is commonly circulated, so collectors shouldn't have any problem finding a souvenir of reasonable quality. Completists however will find it difficult to get their hands on all available recordings. The only other circulated footage out there at this point in time are 4 songs from an audience recording of Blackburn: "November Spawned A Monster", "Hand In Glove", "Irish Blood, English Heart" and "There Is A Light That Never Goes Out". Two songs from London's Brixton Academy were filmed, but this footage is not really being shared at this point in time. Sound-wise the best recordings for this period are the ones from Paris (l'Olympia), Adelaide, Malmö, Paris (La Mutualité) and Glasgow. This leaves average to good sounding recordings of both London dates at the Royal Albert Hall, both Melbourne concerts, Perth, Copenhagen, Birmingham, Bradford, Blackburn, London-Brixton Academy and the second Athens show. The bad recording of the Sydney show will appeal only to completists and only one song from Stockholm has made it into circulation at this point in time.